The beautiful blue-throated hillstar faces oblivion because the only place it is found in the world is rich with precious metals. Fears that mining will drive the tiny bird with its iridescent emerald and sapphire plumage from mountain haunts have sparked conservation efforts to protect the remote area in the wilds of Ecuador. It is believed the same 12,000ft Andean mountain tops where the hillstars glisten could also harbour other species yet to be found. 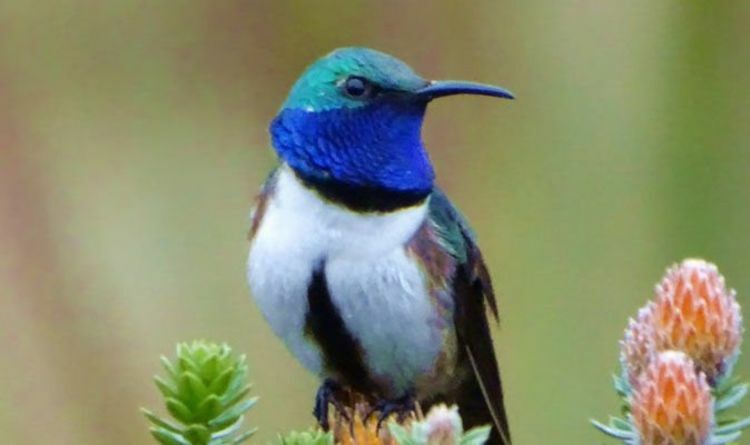 The discovery of the blue-throated hillstar – scientific name Oreotrochilus cyanolaemus – in an area of rugged Andean landscape where the birds have to go into a state of torpor to survive the montane cold was only announced last September. Surviving on nectar, the birds are confined to bush-lined creeks that span across an area of less than 45 square miles. This alpine tundra, known as paramo, also plays host to other rare and elusive creatures such as the spectacled bear, mountain tapir and Andean condor. An amphibian new to science, the tik tik rain frog, was also discovered nearby last summer. Yet Ecuador’s geology that has created many a wildlife paradise also holds untold riches that have witnessed industrial-scale mining across the country's tropical forests over the past 30 years. The lure of gold, copper and lead has led to the creation of vast open pits to the detriment of the wildlife. Concerns that the hillstar’s habitat could also be swallowed up by mining has seen the international conservation charity World Land Trust launching a £30,000 appeal. The WLT’s Save the Blue-throated Hillstar fundraising efforts will allow its partner Naturaleza y Cultura Ecuador (NCE) to extend a water protection area to include the hillstar’s 70,000 acre range, so achieving government-level protection and eliminating the mining threat. It will also preserve the clean freshwater essential for nearly half-million people. Richard Cuthbert, director of conservation at WLT, said: “This is a unique opportunity to save a critically endangered species from extinction. “If we do not act now, mining corporations can move in on the habitat and create a mine which would most likely wipe out the hillstar population. The head of community development at NCE, Bruno Paladines Puertas, explained why speed is of the essence. He said: “Mining is happening in lots of areas in Ecuador. We are lucky that this area is in an early stage of the process before any construction has begun, so there is still time to act.